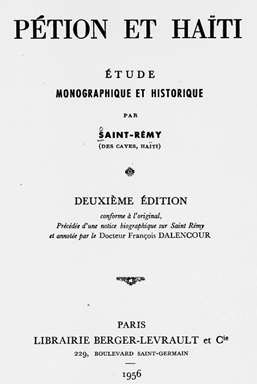 ﻿An excerpt from Saint-Rémy’s Pétion et Haïti: étude monographique et historique (1954-1957). Saint-Rémy was a renowned historian. He was born in Guadeloupe but moved to Haiti and later to France. Anne-Alexandre, known as Pétion, was born in Port-au-Prince, along Revolution and Orléans streets, on April 2, 1770. He was the son of Mr. Pascal Sabés, a white male, and Madame Ursula, a mulattresse. Although he was a quadroon, with mixed blood, he was black with straight hair, which was mistaken for Indian. Allegedly, the black skin of the newborn made [Mr. Sabés] doubt his paternity, and he refused to give his [last] name [to Pétion]. Pétion at the age of eighteen was a soldier in the militia. [During the Revolution] Pétion [stated] that blacks and mulattos were starting a national war and this was not the time, in the presence of whites, to think about vengeance; [they] must forget the past. Pétion then led [Jean-Jacques] Dessalines’s insurrection and [became] insurrection and [became] distinguished serving under the fierce leader. 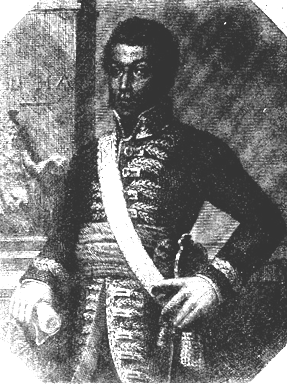 [After the assassination of Emperor Dessalines in 1806], Pétion was in disagreement with [Henri Christophe] the country’s interim leader, who refused to recognize the constitution. 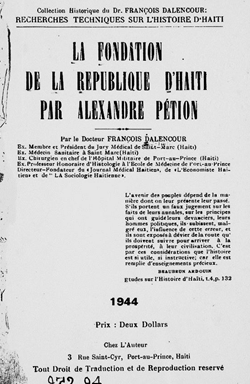 [Pétion stated in 1806] I would like to publicly declare, to my fellow citizens, my honorable intentions which guide my character and my actions, especially after Dessalines’s destruction, and now that of General Christophe, which brings to our midst the flame of civil war, seeking to destroy our freedom that we have finally acquired after such long storms. [Later Christophe] was crowned King of the North; and the Senate proclaimed General Pétion the President [in the South] of Haiti. The Senate approved Pétion’s proposal on April 21, 1807, which authorized the distribution of land to a minimum of ten carraux [about 31 acres]. Pétion, then President for Life, had decreed that everyone who gave service has a fair share in the wealth of the country that gave them their rights. He decreed that every citizen should become an owner of the soil, which the army had conquered from the French and the colonizers. Pétion knew that land division was the end of caste and aristocracy divisions. Where such divisions existed, there would be no other privilege than to work the land to elevate oneself, economically speaking, by working for oneself without any feudal loyalty, while increasing one’s welfare and the state’s as well.